It’s great to have friends or family come to visit but the effort to prepare food can make impromptu invitations off-putting. And when it’s a lovely day none of us want to be slaving in the kitchen cooking. Whip up a few of the fabulous drinks below and serve with a variety of crisps, nuts, olives etc. With a variety of drinks – including plenty of non-alcoholic – it’s perfect for a gathering of people of all ages. Make all the drinks in advance and store in the fridge so that you can enjoy the afternoon with your visitors. Pour the hot tea into a jug, add the mint sprigs and stir in the sugar to taste. Leave to brew and cool completely. When ready to serve, remove the mint sprigs. Scoop the lemon sorbet into four tall glasses and pour in the tea. Decorate with strawberries and mint and serve immediately. and heat gently until sugar has dissolved. Taste and adjust sugar and lemon juice to taste. Remove pan from the heat and leave to cool. Strain liquid (if wished) into a jug filled with ice. Put banana in a blender with orange and pineapple juices. Add milk and whizz to blend. Put a scoop of ice cream in two glasses and top up with fruit milk. Serve immediately and with straws, if you like. Put raspberries, strawberries, ice cream, milk and yogurt into a blender and blend until smooth. Pour milkshake through a non-reactive sieve into a large jug (to remove seeds), and then pour into four large, well-chilled glasses. Serve immediately. TIP For some extra pizzazz, top each glass of milkshake with a spoonful of whipped cream topped with raspberries. Make a slit in each strawberry, place on rim of each glass and serve. Put coffee and sugar into a heatproof jug, stir in boiling water, cover and leave to cool for 5–10 minutes. Mix coffee with milk and chill well. When ready to serve, pour coffee into a liquidiser, add ice cream and blend well. Pour into tall glasses, sprinkle with chocolate, if using, and serve immediately. 1 Go to the seaside. As we’re a small island nation most of us can drive to the sea in less than 2 hours. In fact the village considered furthest away from the coast in Britain is Coton in the Elms, Derbyshire; a mere 70 miles from the sea. There’s something magical about the seaside. Everything smells good (even those fried doughnuts! ), the sound of the waves and seagulls lull you into a relaxed state and for me, it always reminds me of childhood day trips and holidays. So breathe deep and enjoy the sea air! 2 Write exercise in your Dairy Diary. With a hectic life, it’s not always easy to fit in exercise but I have found a very nifty trick to sticking to my new found ability to run (it only took me 40 years!!) – write it in the diary. If it’s there on paper, slotted into an available gap you’re far more likely to stick to it. You can even tick it off when you’ve done it and feel really virtuous! 3 Make a holiday photo collage. How many holiday photos do you have stashed away on the computer or in old dusty albums in a drawer somewhere? Enjoy them instead! Choose one really lovely image from each holiday and make a collage – either with prints or make one with digital photos online and get it printed via a photo website. Frame your creation and put it somewhere you can see it every day and remember all those cherished moments. 4 Treat yourself to a pedicure and show off your toes. Summer means sandal time, so book yourself in for a proper pedicure – I love Shellac or Minx because they last and you can enjoy gorgeous shiny or sparkly toe nails all summer long. 5 Go on a picnic. Make this an impromptu affair with a blanket, a few of your favourite foods (homemade or bought from your local deli), and your favourite view. Bliss. When going walking we often head off in the car to some ‘route’ I’ve found in a walking book. This summer, instead I plan to explore our locality and discover where all those public footpaths lead to that we have never walked. I just hope we don’t get too lost! 7 Wear your favourite dress on an ordinary day. We so often save gorgeous clothes for ‘best’. But how often do we actually get to wear them? Tomorrow, wear that beautiful dress and enjoy it rather than saving it for a special occasion that may never arise. 8 Spend the evening in the garden. Whizz up a dip and take it into the garden with a bag of crisps or crudité and a chilled bottle of rosé or elderflower fizz. You’ll probably need a blanket or warm cardigan but enjoy the long summer evenings and having some tv-free time. 10 Make a different salad for lunch every day this week. Dairy Diary is giving you the chance to win a £50 voucher to spend on whatever you fancy in over 200 garden centres and nurseries throughout the UK. Seasonal Garden Ideas is a beautiful book featuring easy half-day projects, with easy-to-follow instructions, to add beauty to any garden. There is lots to do through all four seasons: spring, summer, autumn and winter. Now available for just £3.99! The big news this week is the launch of Seasonal Garden Ideas: a new gardening book that will inspire both novice and experienced gardeners this spring. 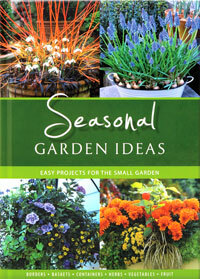 Seasonal Garden Ideas is a beautiful book featuring easy half-day projects to add beauty to any garden throughout the year. Each of the 77 projects is presented like a RECIPE; with ingredients, step-by-step instructions, hints and tips, time required, when to start and aftercare. Now doesn’t that sound simple? When you turn to a project you will be delighted with how the information is clearly laid out to make the task so straightforward. Each project is illustrated with a beautiful colour photograph. Excellent value at just £9.75. Order it from your milkman or online while stocks last. I love Welsh lamb and this Minty Lamb Pattie is the perfect excuse to support Welsh farmers and enjoy one of the best ‘burgers’ you’ll ever taste. Sounds naughty, but this is a nicely balanced meal. Try it and I think you’ll add it to your ‘favourites’. Minty Lamb Pattie is taken from the popular Around Britain Dairy Cookbook which is available for a short period at the incredible price of just £2.99 while stocks last.